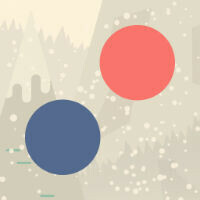 Dots was, and still is, a very addictive game. If there was one negative that could be said about it, it was that the game wasn't very deep. There was the endless mode, the timed mode, and the newly added challenge mode to give a bit of multiplayer. But, at the end of the day, you're just aiming for a high score and that's about it. The sequel, TwoDots takes the basic gameplay, but puts it into a puzzle format very similar to Candy Crush Saga. At first, you'll just have to gather a certain amount of various colors, but pretty quickly, you'll have to deal with bringing anchors down to the bottom, setting off bombs, and more. The size and layout of each board varies, with some being quite small and made more limited with blank spaces, angled barriers to shift how dots drop, all the way to huge levels that test your planning skills. It adds a lot more complexity to the game, which is nice. But, it also adds in a more aggressive free-to-play system. Dots had a few power-ups that you could earn through grinding and gathering dots if you didn't want to pay, but TwoDots keeps things a bit more traditional by limiting to in-app purchases to buying extra moves, bombs, or refill your life meter when it runs out (99 cents each). Unfortunately, because of the shift in gameplay, it also means that sometimes you'll feel as if you win less because of your own skill and more because of the luck of the drop. In this regard, you may feel a bit more cheated by the in-app purchases than you did with the original Dots. Still, TwoDots is a lot of fun, and has the same great music and personality that you'd expect from a Dots game. Right now, it is iOS only, but the Android version is in the works and is said to be on the way later this year, which is not the kind of wide range you want to hear when you're less than half way through the calendar.